This is a super easy salad to make anytime! I am using canned citrus fruit, but if you want to use fresh fruit feel free to segment the fruit. Also you can opt to use fish or chicken instead of the shrimp I chose to use. For the dressing I am simply drizzling the salad with Ruby Red Grapefruit Aged White Balsamic Vinegar and can be ordered on-line at Spicewood Food Company. Serves 2. Peal, devein the shrimp and put into a pot of boiling water for about a minute they will turn pink when done. Set aside or put in fridge to cool. Prepare rest of salad by draining the Citrus Salad or segment your fruit. Thinly slice a few strands of a red onion to your liking. On a chilled plate add a handful (about 1 1/2 cups) of Arugula or salad greens of your choice and drizzle with Ruby Red Grapefruit Aged White Balsamic Vinegar and toss. 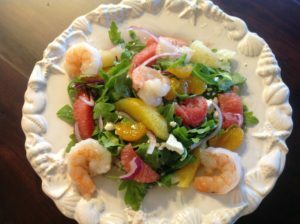 Add half of the citrus segments, red onion, feta and shrimp and give the salad another drizzle of the Balsamic Vinegar, serve and enjoy!